A typical infantry regiment in the American Expeditionary Force of the Great War included one Machine Gun Co. During an offensive, the Machine Gun Co. was relied upon to lay down suppressing fire from behind the advancing infantry troops, moving forward with the advance, and also provide fire in case of retreat, which meant holding their position until the returning troops had passed through them to form a defensive. Each division also included machine gun battalions which were assigned as needed along the line of advance. Machine guns of the day were heavy and required use of mule drawn carts to maneuver to front line action, the final placement on foot. Types of gun used by the 314th include the US made Browning and the French made Chauchat. The following type written account was done by a Edw. J. Brill at an unknown date. No mention of a trip home is made, so it may have been done in France, before boarding ship. There has been no editing done to ensure historical accuracy. Note should be taken to spelling and punctuation. The history of the Machine Gun Company, 314th Infantry, dates from September 21, 1917, at Camp Meade, Maryland. This date marks the organization of the company. 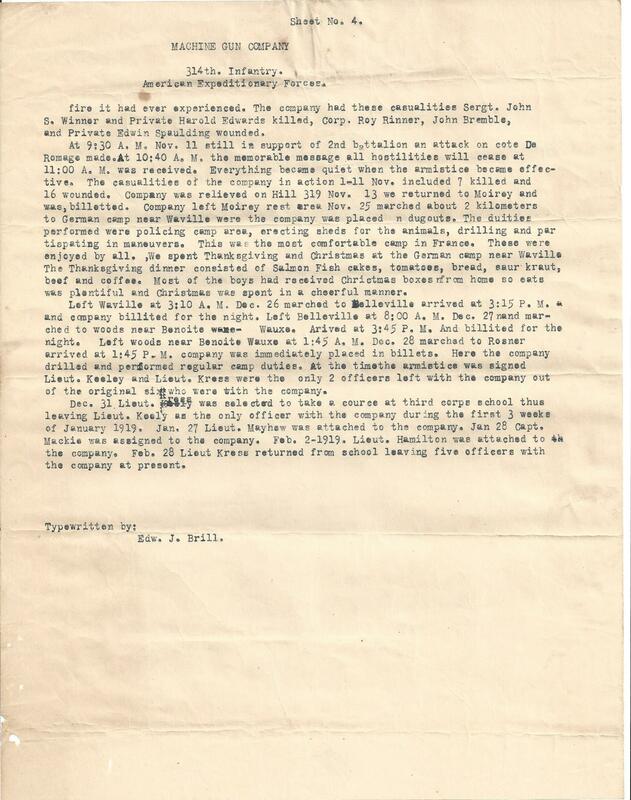 At the time of organization, this company consisted of 35 enlisted men and 6 officers. Captain Frank F. Battles was placed in command of the company, assisted by Lieut. Leighton Smith, Edward Mylin, Maurice Colbert, Fred Gerard and John Kress. The training of the company at first was along the line of general military work, the men being taught the fundamental military principals of discipline and drill. The company was increased by new men from time to time and many men were transferred to other branches of the service for which they were better fitted. Our first training with machine guns was the Colt Machine Gun. Then wooden guns were issued, modeled after the Vickers Machine Gun, but it was not lone until these were battered to pieces by ling and intensive drills. Late in the spring the company received the new Browning Machine Guns and the full quote of machine gun carts. Finally orders were received to move overseas. An advance school detachment consisting of First Lieut. Keeley and Lieut. Kress and Sergeants Mylin, Gill and Wintersteen left Camp Meade June 28, 1918, and sailed for France June 30. The Machine Gun Co. left Camp Meade July 6, 1918, proceeded by train to Jersey City, N.J., thence by ferry to Hoboken and boarded the U.S.S. Leviathan, July 7, 1918. With the troops aboard including different units of the 79th Division, the Leviathen left port at 6.00 P. M., July 8. Eight days were spent on the water and to the surprise of most all on board the voyage was uneventful. A convoy of 5 destroyers accompanied us through the danger zone, but no submarines were sighted. Landed at Brest, France, July 15 and marched to a field near Pontanezen Barracks outside of Brest and pitched camp at 1.00 A.M., July 16, 1918. Here the company performed the usual camp duties. Broke camp in field near Pontanezen Barracks at 7.20 A.M. July 19. Marched to railroad station at Brest and entrained at time of arrival, leaving Brest at 11.30 A.M. this date. Travelled via rail thru St. Brieuc, Rennes, Angers, Gours, and Dijon to Chatillon-sur-seine. Detrained at 7:30 A. M. July 22 and marched to Ampilly-le-sec where the company was billeted. During the short stay here the company engaged in usual camp duties. Left Ampilly-le-sec at 8:45 P.M. 24th. and traveled via motor trucks to Larret arrived at 1.00 P. M. July 25th. here the principal training of the M.G. company in France. Here the company did intensive training including all the different phrases of drill in the use of the machine gun and takeing part in problems and maneuvers. The advance school detachment returned to the company at Larrett at 11:45 Sept. 8. marched about 18 miles to Le ferte, arrived at 8:30 P.M. On this trying march the company maintained it's record. A record unequaled by any other company in the regiment of a man never falling out of line. Entrained upon arrival at La ferte, leaving at 1:30 A.M. Sept. 9. Traveled by rail to Mussy, arrived at 12:00 noon. Detrained immediately and marched to Veel near Bar-le-duc. Arrived at 4:00 P.M. and the company was billeted immediately. Here for the first time the company could hear the distant roar of the guns. Received intensive training at this station. Left Vell at 4:30 P.M. and marched to Fains, entrained there at 7:30 P.M. and proceeded to Recicourt, arrived at 2:00 A.M. Sept. 14. This town was the first one ruined shell fire that the company had seen and was only a few miles back of the lines. The company was shelled here Sunday evening Sept. 15. This being the first time under shell fire, takeing cover in dugouts. The period at this camp was utilized in the inspection, care of Machine Guns, Tripods Etc. Left camp De Ponniers forest, 3 kilometers north and bivouaced in forest De Hesse. Here shelter trenches were dug for protection in case of enemy artillery fire and infantry who were detailed to this company received the necessary instruction as ammunition carriers. While in Forrest de Hesse the company was rather excitable and in a nervious state knowing that we were soon to get into action for the first time. Life was made miserable here at nights by numerous false gas alarms. At this camp Captain Battles was sent to the army sick and Lieut. Keeley took of the company. Left Forest deHesse at 7:00 P.M. Sept. 25 and marched 2 kilometers north of Esnes and immediately deployed for action. The advance began 5:30 A.M. Sept. 26 under heavy artillery barrage with this company in support of the 2nd Battalion, 314th Inf. This was the first stage of the Meuse Argonne offensive. Regiment took Malancourt and Haucourt the first in action Sept. 26. In Malancourt many machine guns were taken. Private Seiders of this company alone took 22 prisoners and 8 machine guns were taken. For this he was later awarded the Distinguished service Cross. The first day in action the casualties of the company were light. Private Nevin Fischer was killed and Private Dennis Holleran And Norman Hillbush were wounded. On Sept. 27th. the 79th. Division took Montfaucon. 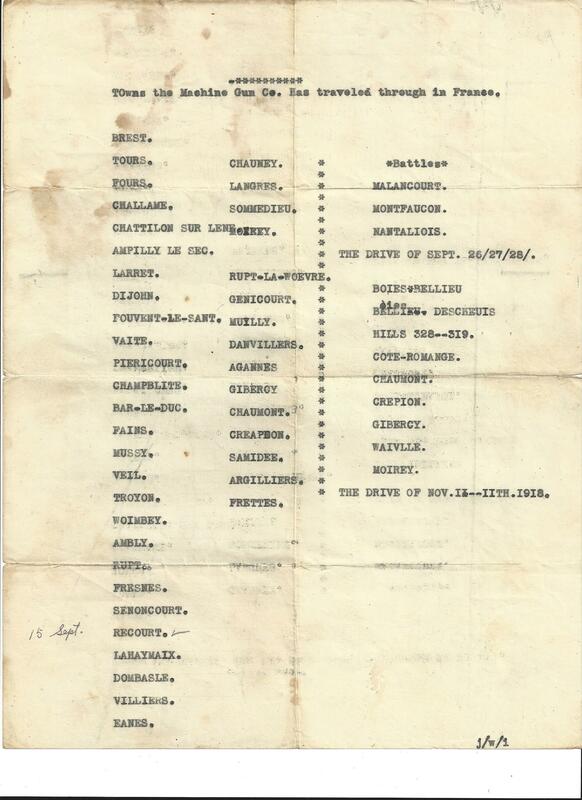 on this date the company had 3 men wounded, Private James Lloyd, Andrew Alplanalp and Farncis Connell. On Sept. 28 the 314th. regiment was placed in Divisional support, 79th. takeing Nantillois. This date our casualities were heavier Private Mac Merrifield was killed Corporal Chas. Cotner was mortally wounded and died later. Corporal Ralph Rapp, Private Howard Smith Frank Gould, Chas. Shaffer, Dight Balch, Chas Trout, James Lawson and Frank Hunter were wounded. Sept. 29 the regiment took up the front lines again but did not advance The 2nd platoon of this company of which Lieut. Dan Dusen was in command was in a position on the road leading from Nantilliois. One large shell fell on the road killing Lieut. Dan Dusen, mortally wounding Sergt. Trapp who died later and wounded Privates Cecil Nephew, Jerrie Buten, Galusha Cook, William Housel and John Dorty of this company and several infantry men who were near by on the same day. Company was relieved Sept. 30 by 3rd. Division. In the five days in which the company was in action it expierenced all forms of enemy fire, artillery, machine guns rifle and gas. The company had acquitted itself well going without food water and sleep. Every member felt almost a veteran when relieved. We marched to Hill near Malancourt and bivounced for the night. 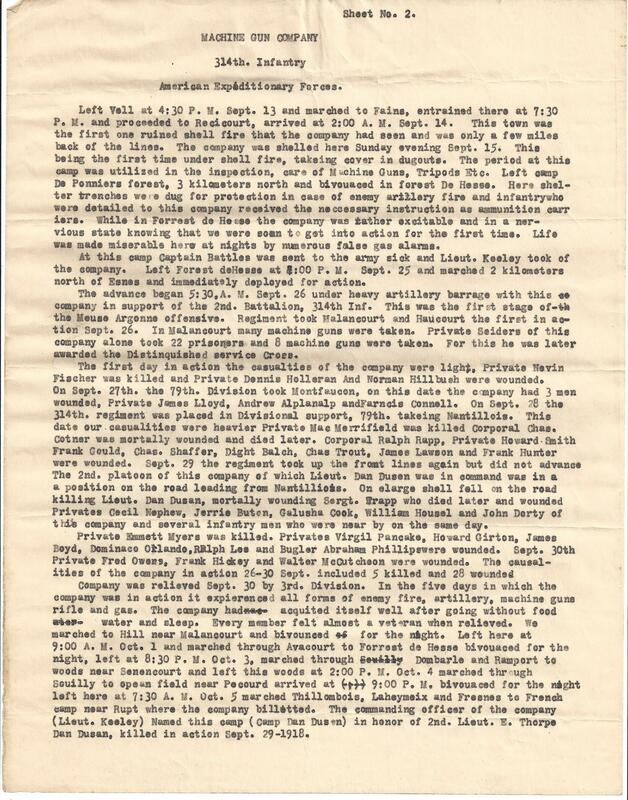 Left here at 9:00 A.M. Oct. 1 and marched through Avacourt to Forrest de Hesse bivouaced for the night, left at 8:30 P.M. Oct. 3. marched through Dombarle and Ramport to woods near Senencourt and left this woods at 2:P.M. Oct. 4 marched through Souilly to open field near Pecourd arrived at 9:00 P.M. bivouaced for the night left here at 7:30 A.M. Oct. 5 marched Thillombois, Laheymeix and Fresnes to French camp near Rupt where the company billetted. The commanding officer of the company ( Lieut. Keeley ) Named this camp ( Camp Dan Dusen ) in honor of 2nd. Lieut. E. Thorpe Dan Dusen, killed in action Sept. 29-1918. Nov. 5 the 1st. and 3rd platoons were still in action in support of the 1st. Battalion. Nov. 6 the 1st. 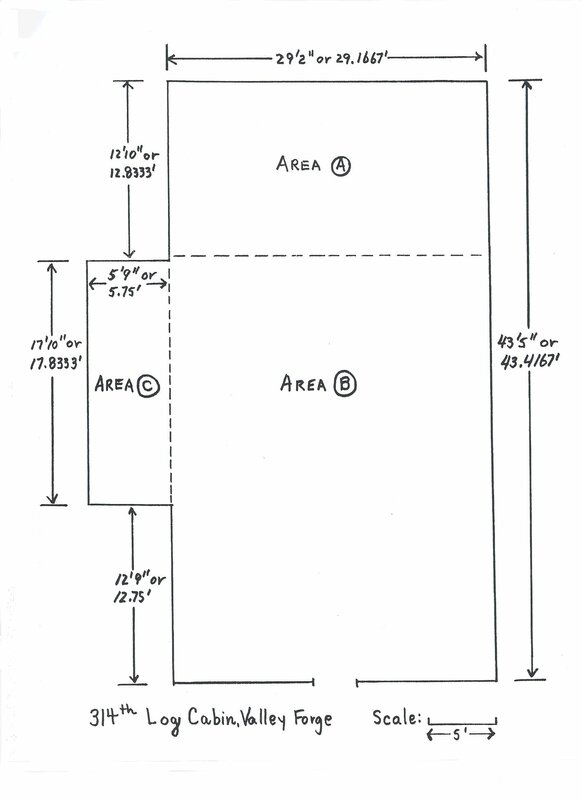 section, 2nd. platoon of this company advanced to Le Heuppy Bois. Nov. 7-8 the 1st & 3rd. platoons of the first section of the 2nd platoon were still in action in Bois Belleu and Le Heuppy Bois. The balance of the company were with the regimental supply train. On the afternoon of the 8th. Nov. the enemy withdrew. from our front due to other American troops crossing to the east side of the Meuse at Dun-sur-Meuse. The company still in support of 1st. Battalion advanced at 6:00 P.M. Nov. 8 without opposition. Nov. 6-7-8- there were no casualities in the company. Nov. 9 the 2nd. platoon went into action in connection with the first and 3rd. platoons and the first section 2nd platoon. The entire company was now in support of the the 1st Battalion. On morning of Nov. 9 the advance continued through the towns of Crepion and Moirey The regiment there came under hostile enemy artillery and machine gun fire. The morning of Nov. 9 brought sorrow to every man in the company when Captain Battles was killed. Because of the able manner in which he commanded his company and the excellent manner in which he led it into action. He was held in high esteem by all who knew him and died beloved by all his men. Lieut. Keeley now took command. This company supported an attack on hill 328 but after reaching crest of hill the 2nd platoon withdrew for artillery support. At 5:30 A.M. Nov. 10 Hill 328 was taken by the 2nd. battalion and the machine gun company took up position on this hill. After enduring heavy artillery and machine gun fire a sudden attack was made on hill 319. This was a surprise and entirely succesful The machine gun company went in to support of the 2nd battalion in the attack on the hill. Nov. 10 there were 4 casualities in the company. Private Francis Kelly was killed, Corp. Wm. McDowell, Privates Lawrence Broderick and James Smith were wounded, Smith died later of wounds received in this battle. At 9:15 A.M. Nov 11 1918 the company passed through the heaviest artillery it had ever experienced. The company had these casualities Sergt. John S. Winner and Private Harold Edwards killed, Corp. Roy Rinner, John Bremble, and Private Edwin Spaulding wounded. At 9:30 A.M. Nov. 11 still in support of the 2nd battalion an attack on cote De Romage made. At 10:40 A.M. the memorable message all hostilities will cease at 11:00 A.M. was received. Everything became quiet when the armistice became effective. The casualities of the company in action 1-11 Nov. included 7 killed and 16 wounded. 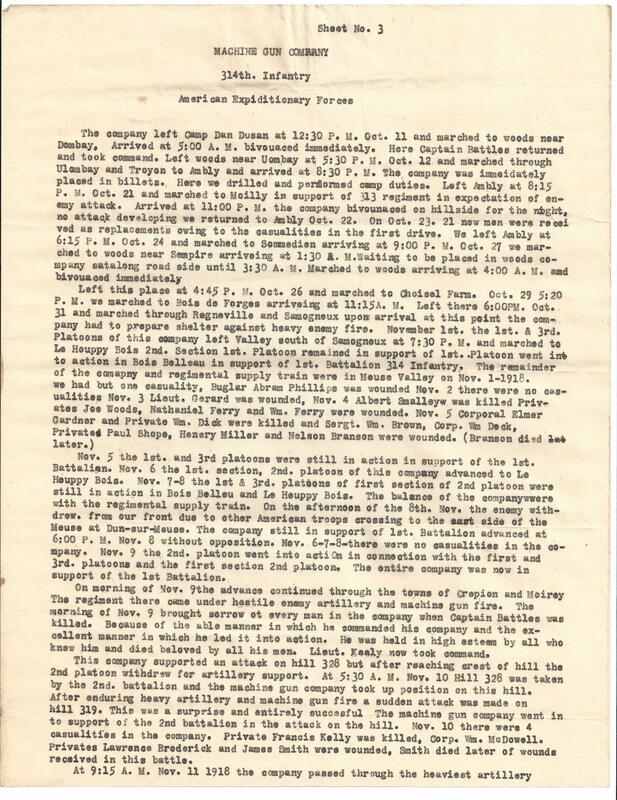 Company was relieved on Hill 319 Nov. 13 we returned to Moirey and was, billetted. Company left Moirey rest area Nov. 25 marched about 2 kilometers to a German camp near Waville were the company was placed in dugouts. The duties performed were policing camp area, erecting sheds for the animals, drilling and partispating in maneuvers. This was the most comfortable camp in France. These were enjoyed by all. We spent Thanksgiving and Christmas at the German camp near Waville The Thanksgiving dinner consisted of Salmon Fish cakes, tomatoes, bread, saur kraut, beef and coffee. Most of the boys had received Chrictmas boxes from home so eats was plentiful and Christmas was spent in a cheerful manner. Left Waville at 3:10 A.M. Dec. 26 marched to Belleville arrived at 3:15 P.M. and company billited for the night. Left Belleville at 8:00 A.M. Dec. 27 and marched to woods near Benoite Wauxe. Arived at 3:45 P.M. And billited for the night. Left woods near Benoite Wauxe at 1:45 A.M. Dec. 28 marched to Rosner arrived at 1:45 P.M. company immediately placed in billets. Here the company drilled and performed regular camp duties. At the time the armistice was signed Lieut. Keeley and Lieut. Kress were the only 2 officers left with the company of the original six who were with the company. Dec. 31 Lieut. Kress was selected to take a corce at third corps school thus leaving Lieut. Keeley as the only officer with the company during the first 3 weeks of January 1919. Jan. 27 Lieut. Mayhew was attached to the company. Jan 28 Capt. Mackie was assigned to the company. Feb. 2-1919 Lieut. Hamilton was attached to the company. Feb. 28 Lieut. Kress returned from school leaving five officers with the company at present. 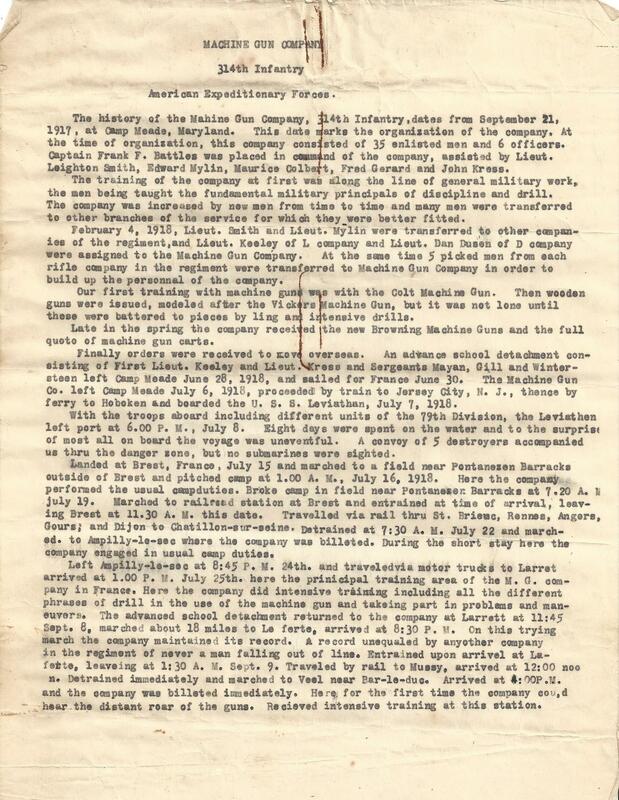 Credit for the five scanned pages below is given to D&F 314th Inf. AEF. and John L. Shetler - member of MG Co. 314th Inf. 79th Div. AEF.